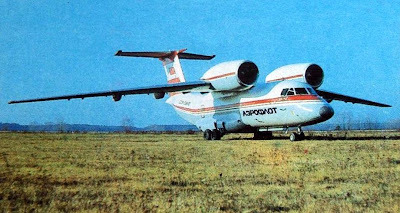 The An-74 was developed as a military transport aircraft and first flew in 1983. A total of 81 were produced and used from 1986. An unusual design feature of the An-74 (as well as the An-72) is the use of the Coandă effect to improve STOL performance, utilizing engine exhaust gases blown over the wing's upper surface to boost lift. The power plant used is the Lotarev D-36 turbofan engine. The An-74 bears a resemblance to the Boeing YC-14, a prototype design from the early 1970s which had also used overwing engines and the Coandă effect. The rear fuselage has a hinged loading ramp with a rear fairing that slides backwards and up to clear the opening. The An-74 has a payload of 7.5 tons, including up to 10 passengers/couriers (up to 52 passengers depending on the variant), an operating ceiling of 10,100 meters and cruising speed of 550—700 km/h.